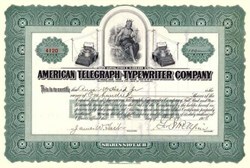 Beautifully engraved SCARCE Certificate from the American Telegraph - Typewriter Company issued in 1916. 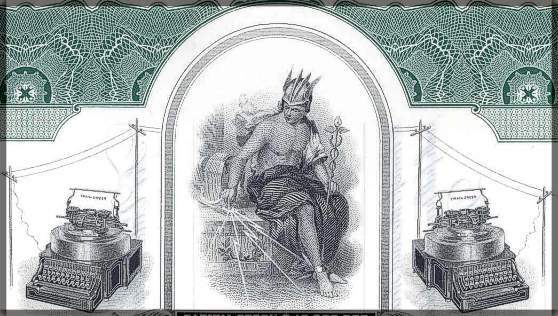 This historic document was printed by the International Banknote Company and has an ornate border around it with a vignette of an allegorical man with a teletype, teletypewriters and telegraph poles and lines. This item is hand signed by President, George S. McAlpin and is over 100 years old. In 1907, G.A. Cardwell founded the American Telegraph Typewriter Company with offices at 27 William Street, New York City, and a factory on Prospect Street, Brooklyn, New York. From 1908 to 1944 Cardwell developed and manufactured variable air capacitors, telegraph sets, and designed, manufactured, and installed the first automatic stock quotation system at the New York Stock Exchange. During World War II, Cardwell developed the famous test sets: AN/TS173, 174, 175, and BC221.